Denomination of Origin DOP Galicia. This is a delicious cone-shaped cheese made from pasteurised cows milk. The word Bufon refers to the shape of the cheese, which is like a jester's cap (Buffoon in English!). It is lightly smoked over birch wood to give a delicate smoky flavour with a nutty aftertaste. 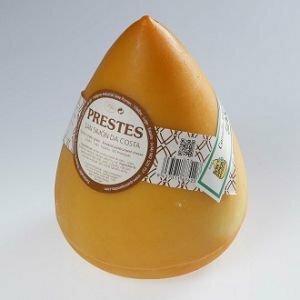 Excellent as a breakfast cheese, in cooking for stuffings or as a melted cheese. To drink: a young, fresh white or light red Rioja. Please note weight of the cheese may vary.